Thank you for coming to the 2018 Barbecue! Thousands took part in the 63rd annual "picnic under the pines" on Sunday, May 20, 2018. 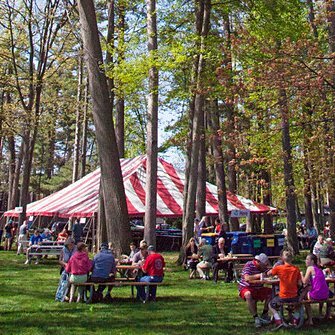 The NMC Barbecue is one of northern Michigan's most popular and enduring traditions. The annual event brings thousands of people to NMC's main campus for an old-fashioned picnic and a chance to see their community college, with about 5,432 meals served at the 63rd annual barbecue in 2018. The late Gerald W. Oleson and his wife Frances, founders of Oleson’s Food Stores in Traverse City, started the annual fundraiser picnic in 1956. Oleson’s Food Stores continue to donate the food, and hundreds of volunteers turn out to make the event happen. Use the link above to go to our volunteer signup page on SignUp.com. Please be sure to click the green SAVE button after selecting your shift(s). This can be found at either the top or the bottom of the list of activities on the sign up page. In 2010, the Barbecue Board made a commitment to become a zero-waste event through extensive use of recycling and composting. More than 90 percent of the residuals from the 2011 Barbecue were kept out of a landfill, and by the 2014 Barbecue, that figure had increased to more than 99 percent. The Barbecue thanks the dozens of volunteers who helped guests properly dispose of their materials at recycling/composting stations around campus, and partners American Waste (recycling, equipment), Food for Thought (composting) and Rentals Unlimited (equipment). Proceeds from the NMC Barbecue help fund special projects at NMC.